It's felt like months since I posted about my Joules denim dress that my mother in law bought me. We saw it during one of those lovely sunny days back in April...which was followed by two months of winter. I began to think I'd never get to wear it - but today was the day. Another reason for not wearing it was because I really wanted to get a pair of flat tan sandals to wear with it and I struck gold during a quick duck into Topshop yesterday. While I loved the Fig sandals that so many bloggers have been rocking, I wanted to get something a bit different and ideally less expensive so these ones for £26 were ticking lots of boxes! I kept accessories simple with a tan leather Hermes necklace and matching bracelet that a friend bought me about 11 years ago...it's a set that comes out every now and again and reminds me of a lovely lady who befriended me when I was struggling to cope with the demands of being a new mum, alone at home all day with an unsettled, colicky little boy. 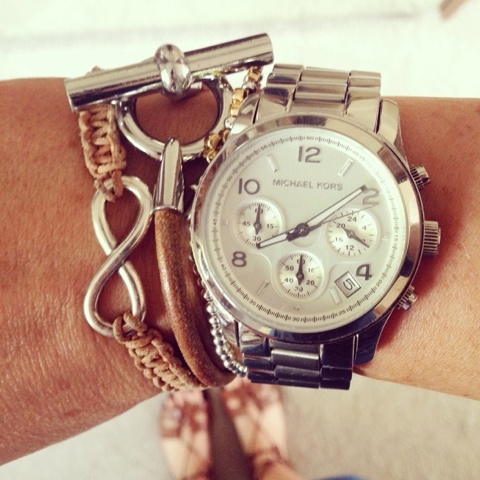 I also wore a tan leather infinity bracelet from Jo's Arm Candy, a Jolie Daisy bracelet (just seen) and my Michael Kors watch - one year on, I still love it and think about New York every time I look at it! I'm still undecided on the dress length. When I featured it first, I talk about shortening it by an inch or two but I wanted to wear it for one full day without turning it up, to see how I got on with it. While I think it would look more flattering on my height if it was a bit shorter, I feel much more confident wearing it at this length....so the jury's out for another time. 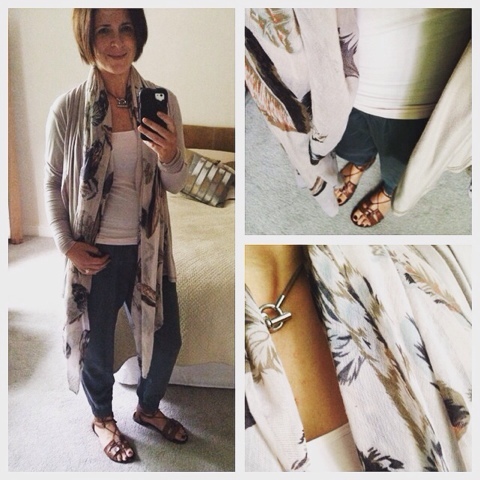 Once things cooled down this evening, I switched into my Hush Avignon trousers with a jersey cardigan and scarf. and posted about it on the Facebook page. It turns out lots of you use White to Brown and rate it highly. And I can join the gang as I'm so pleased with it. It's quite dark in colour and needs to be put on with a mitt but it's creamy enough that you can spread it well. Best thing is that the dark colour ensures you can see where it's going and avoid streaks/patches. Not too smelly either which is a bonus. I hope you've had a good week and you're looking forward to the weekend. Oh that dress is lovely on you & I love the matching necklace to your bracelet. The tan sandals are very like a pair of old faves of mine. Lovely outfit! I adore those sandals - I think I'm going to buy! 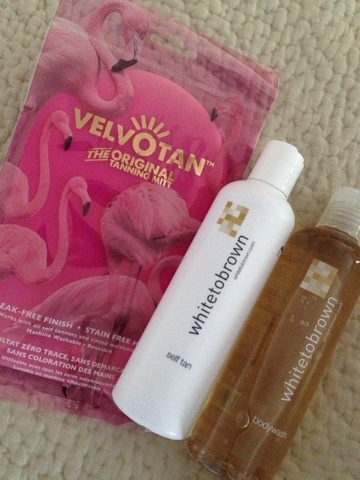 Interested by the tanning stuff too as I use Dove/Gradual moisteriser two or three times a week and then Cocoa Brown on my legs when needed. Those sandals are stunning - why have I not seen them before - are they new stock at Topshop? Looks great with your lovely dress. And the gorgeous jewellery - perfect for the outfit. Can you advise as to the comfort factor of the shoes please? Beautiful sandals. Very versatile. Would be perfect for holidays. Love those sandals Avril, great with the denim dress. And I would have asked for tan details as I thought your tanned legs look great in that photo,but then you kindly gave us the tan details anyway!